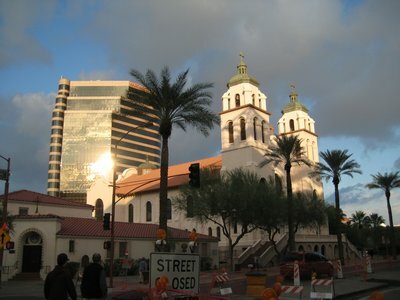 Lake Pleasant, Camelback Mountain, downtown Phoenix and the NBA action in US Airways Centre. As I stated in my last entry, Thursday was the Thanksgiving holiday here in the USA, and Friday is a kind of defacto holiday as well, so I had a four day break. On Thursday not much was open, and the skies were grey and threatening. 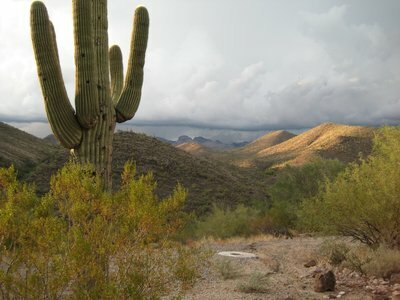 It was not exactly a great day to do much, but I did manage to get out to see Lake Pleasant Regional Park. 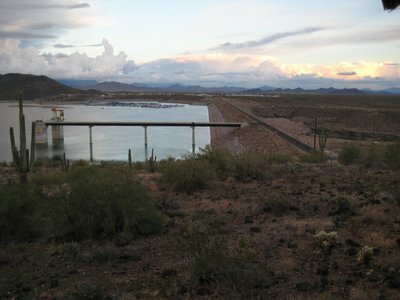 Lake Pleasant was created by the Waddell Dam, and as the closest major body of water to Phoenix, it is a very popular recreation area. On Thursday, with the rain and the fact that it is winter, there weren't too many people on the water, but the RV Park was pretty crowded. Lots of folks were out grilling their Thanksgiving dinner. I've never really thought about doing an RV trip, but I must admit that the folks who had their BBQs out and had set up their picnic tables, it looked like it might be fun. 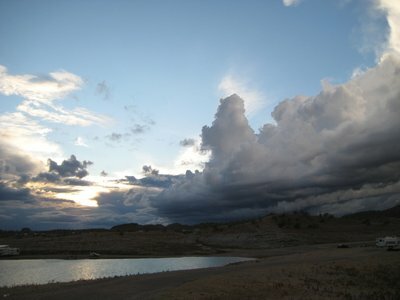 I did a small hike, but the rain started moving in from the west, and so I turned back after only half a mile. 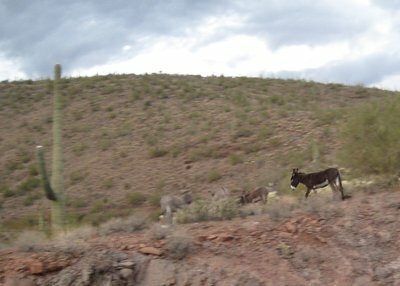 On the way out of the park, some donkeys were hanging out at the side of the road. I assume they must be wild donkeys, as this is a park and as such a farmers grazing animals wouldn't be allowed in the park. Friday is known as Black Friday here in the USA, and is one of the most important shopping days of the year. It is considered the start of the Christmas shopping season, and is called Black Friday because it is often the day of the year when retail stores become profitable for the year - moving from red to black. 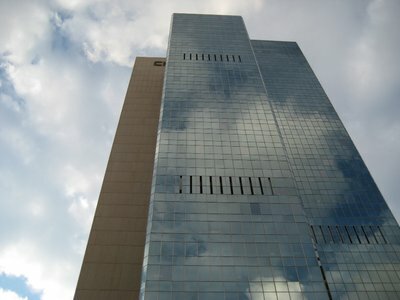 It is a crazy day for shopping, and I avoid the malls at all cost. The crowds can be intimidating, and sadly, this year a Walmart worker was trampled to death when opening the doors of a store in Long Island, New York. 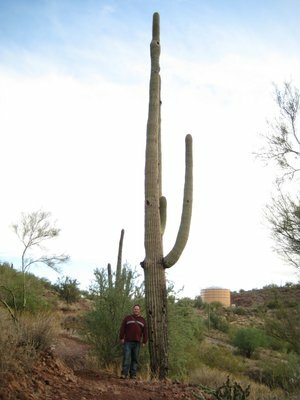 I avoided the crowds at the mall and decided to hike up Camelback Mountain. 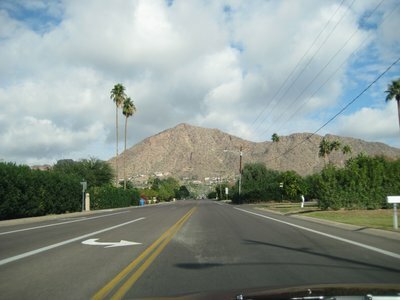 Camelback Mountain is in Phoenix, and is called such because it has two peaks. 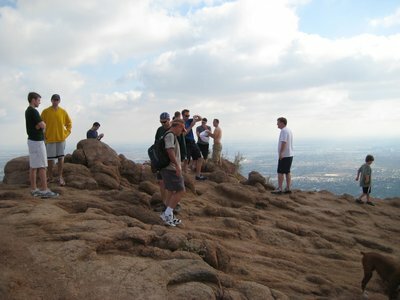 Unfortunately, the hike is very popular, and it was pretty crowded climbing up. 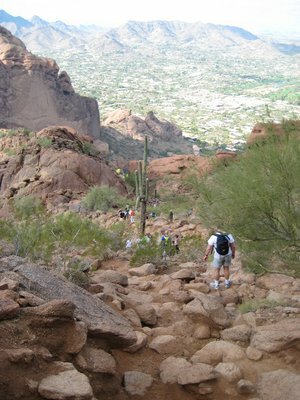 It is an incredibly tough hike. 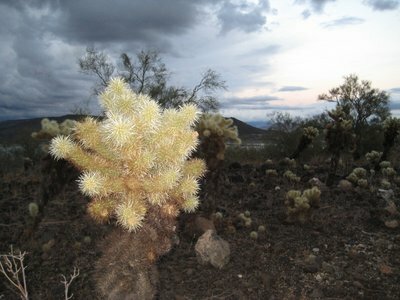 The trail from Echo Canyon to the summit is only one and a quarter miles long, but rises 1,200 feet in that time. 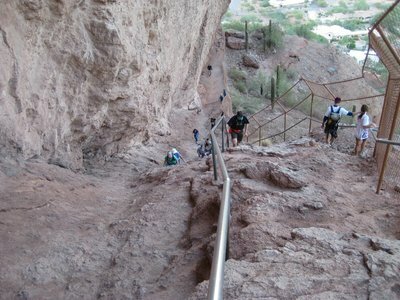 The trail starts with stairs, but quickly becomes a rough and rocky climb, including some areas where scrambling is required. I wasn't sure I was going to make it. About a quarter of a mile in, I suddenly found myself very faint and felt dizzy. I had to sit down on a boulder to rest, drink a lot of water and eat a granola bar. 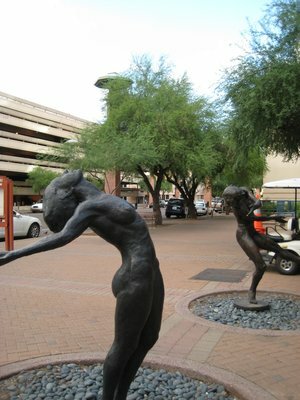 I would have turned around right then, but until the dizziness past I didn't want to head in either direction. 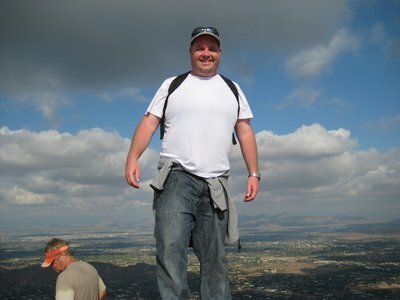 After resting for a few minutes and gaining some energy from the food, I was ready to continue the hike up. It was very slow going though. It took me 2 hours and 15 minutes to cover the 1.2 miles, a distance that I could walk in about 30 minutes on flat ground. I took a lot of rest breaks, and a few times I thought about turning back round, but continued on until I did reach the top. 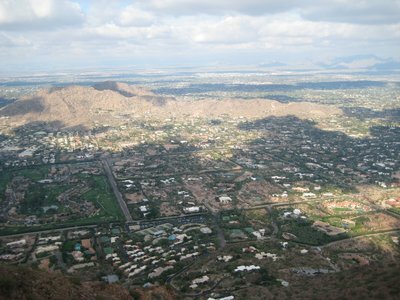 The view from the top of Camelback is pretty impressive, as most of the rest of the Phoenix area is flat. 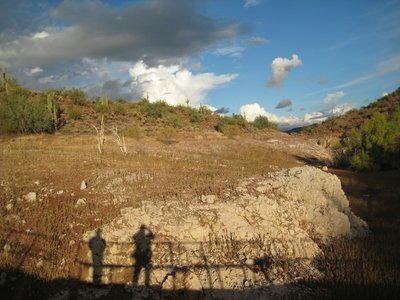 Despite the tough going, lots of people were out hiking the trail and made it to the top, so it was pretty crowded up there. Despite the crowds, it is worth doing. 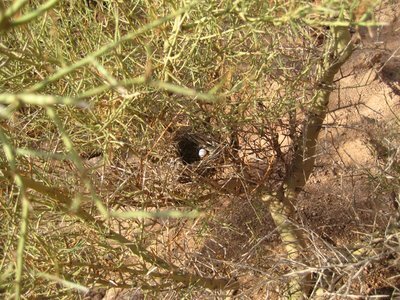 The views are amazing, and there is a few bits of wildlife to see. 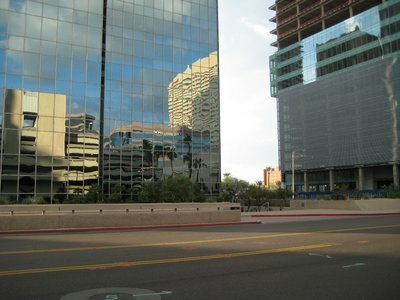 After the hike I decided to do something a little less strenuous and decided to walk around downtown Phoenix. 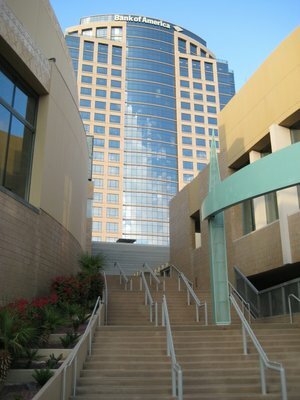 Given what I have written about in the blog so far, you might think that Phoenix is all red-rock canyons and hiking, but it is also a modern city, with big tall buildings and major corporations in downtown. 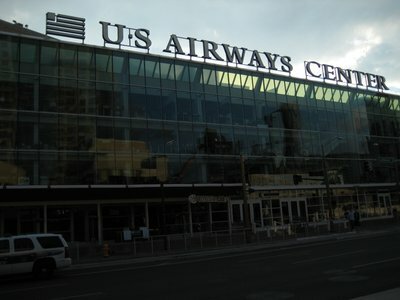 While downtown, I wandered by the US Airways Centre, an arena in downtown. 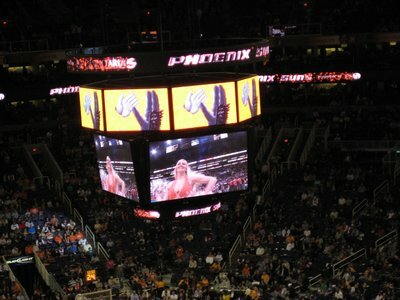 Turns out there was a NBA Basketball game on, with the local team - the Phoenix Suns playing the visiting Miami Heat. I went to a nearby ticket broker, bought myself a single ticket and went to the game. ...what was I talking about? Oh, right, the NBA game. Sorry, I got distracted there for a minute. 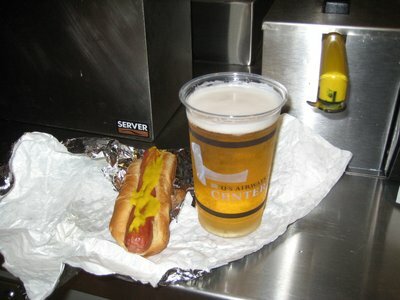 After snapping the above photo with the Suns' Dancer, I grabbed myself some good food and headed into the arena. 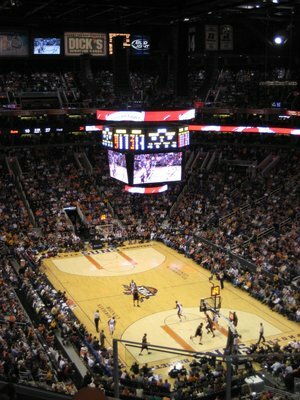 The Phoenix Suns has a few famous faces, including thespian, lyricist and sportsman Shaquille O'Neal. The team also includes players from Brazil, France, Solvenia, the Virgin Islands and Canada. 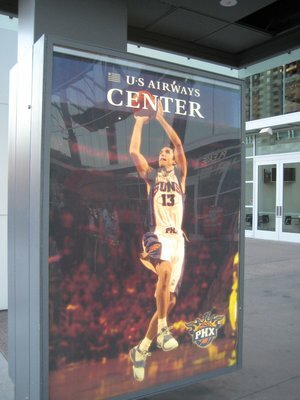 Steve Nash is a Canadian who was born in South Africa and now plays in Phoenix. Man, he gets around. Unfortunately, he wasn't playing on Friday due to a thigh injury, so the best I could get is this photo from a nearby poster. I am not a huge basketball fan, and generally don't watch it at all. The games in person, though, are something else. More than any other sport I have seen, the NBA has a lot going on at all times. 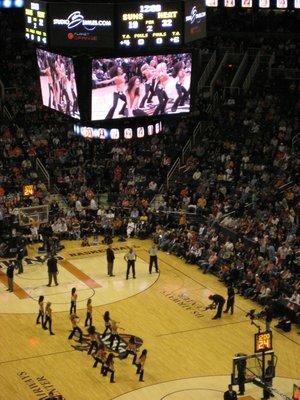 It is the only sport where they play music during the course of play, and there is amazing amounts of fan participation and entertainment during the breaks in the game action. 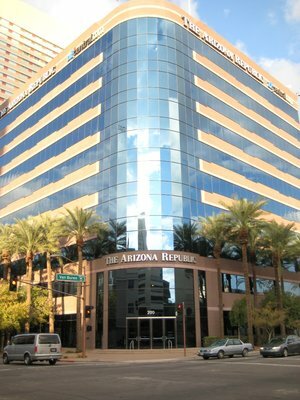 In Phoenix, they call their "universe" Planet Orange, which includes the players, coaches and all the fans. Entering the arena is coming to Planet Orange, and you, as a member of the audience, have a job to do. You are the sixth man, and you need to cheer on your team. 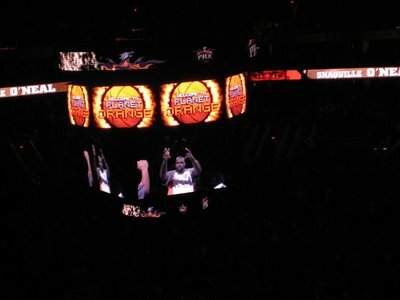 It is not a game you are watching, but a mission - a mission for the Phoenix Suns and their fans to beat the Miami Heat. The program, called "Free Throw," defines Planet Orange as "a world where the atmosphere is electric and the laws of gravity do not apply. 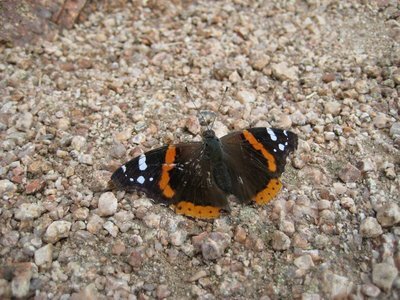 It is a world where all the inhabitants share a common trait. They are all fiery, fervent and forever Suns fans, and every one of their attitudes is colored exactly the same. Welcome to Planet Orange. 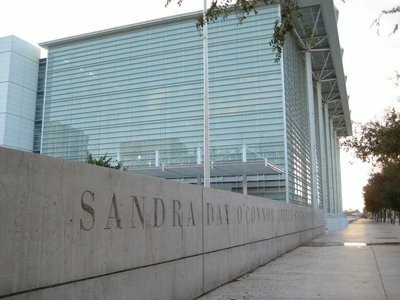 Are you a citizen?" Photos don't really capture it, so here is some video clips of stuff that was going on during and between the action of the game, so you can get a feel for the level of excitement and entertainment during the game. If you can't see the video embedded (mostly for Facebook folks), you can go to Youtube to see it now by following this link. 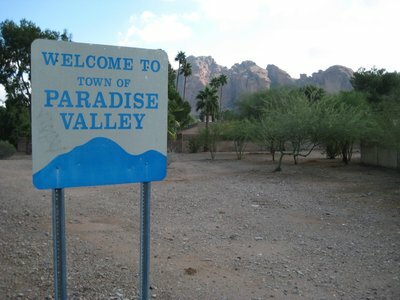 Unfortunately for the citizens of Planet Orange, Phoenix lost the game. That's okay, it is a long season. You were busy this weekend! All I managed to do was lose at bingo and buy a bunch of two buck chuck at Trader Joe's.